US rapper 50 Cent - real name Curtis Jackson - is set to go-head-to-head with rap star Kanye West when both their albums are released on 11 September in the US. 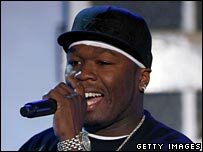 Fans of both artists are being forced to choose between the two as 50 Cent has announced if West sells more records then he does, he will stop releasing solo material. Speaking to the hip-hop website, Sohh.com, he said: "I'll write music and work with my other artists, but I won't put out any more solo albums." So who has got what it takes to win over the world of rap and become the ultimate artist? Grew up in Queens, New York. He raised by his mother until she was murdered when he was eight. At the age of 12 he began dealing crack cocaine on the streets of New York. In 2003 his debut commercial album, Get Rich or Die Tryin', sold over 900,000 copies in its opening week and reached number one in the US Billboard album charts. He has earned 11 Grammy award nominations. Shot nine times at point-blank range whilst sitting in a car in the US. "The only thing that I'm scared of is not livin' up to the expectations of Dr Dre and Eminem." "I think it's easier for the general public to embrace me in a negative way. You have people who already have a perception of me that says I'm a bad person." 50 Cent has feuded with Jadakiss, The Game, Ja Rule and Fat Joe. Eminem and Dr Dre both helped launch his career. Born in Atlanta, Georgia, and raised in an upper-middle class background, he lived with both his parents until their divorce. He then moved with his mother to Chicago, Illinois. 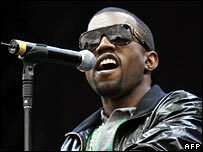 He launched his second album, Late Registration, in 2003 which became number one on the US Billboard album chart, selling 860,000 in its first week. He has won a total of five Grammy awards. Involved in a car crash which left him with a metal plate in his chin. "I hate the way they portray us in the media. You see a black family, it [the media] says, 'they're looting'. You see a white family, it says, 'they're looking for food'. And, you know, it's been five days [waiting for federal help] because most of the people are black". He has worked with Pharrell, Jamie Foxx and in the early days Twista. Conclusion: Judging by the amount of Grammy Awards West has won it would appear the industry favours his music. But with 50 Cent's previous track record and his ongoing feuds, he is not to be messed with. It looks like it will be up to the fans to decide who is the better rapper when they go head-to-head. Kanye West and 50 Cent's albums are released in the UK on 10 September.